Global aviation has recently got a peek into the upcoming premium economy cabin unveiled by Singapore Airlines. The brand new premium economy cabin will be launched on Singapore’s National Day that is August 9. It will be rolled out on select flights between Singapore and Sydney, initially. Passengers flying to London Heathrow and Manchester will experience the new cabin from August 28 and September 22 respectively. Singapore Airlines will gradually roll out the new premium economy cabin on flights to Delhi, Beijing, Hong Kong, London, Mumbai, Frankfurt, New York, Shanghai, Zurich and Tokyo. A380 and B777-300ER in Singapore Airlines’ fleet will be equipped with the new cabin. The upcoming A350 aircraft will be equipped too. The cabin will have 28 seats. The new premium economy cabin will be furnished with leather seats whose width will range from 18.5 inches to 19.5 inches. The seats will have an 8-in recline. The new premium economy seats will be complemented with 13.3-in full HD monitor screens, which according to Singapore Airlines, are the largest in its class. Noise-cancelling headphones will be provided to the passengers. However, the premium economy seats will have different widths on different aircrafts – A380 and B777-300ER. But the premium economy cabin’s inflight entertainment system will be the same on all aircrafts. Only the B777-300ER will have inflight entertainment systems with touchscreen capabilities in the new premium economy cabin. The premium economy seats will come with a few amenities including calf rest, foot-bar, power outlets, USB ports, in-seat reading light, cocktail table and extra stowage area to ensure high-level convenience for passengers. Also, the seats will be accessorized with branded cushions and blankets. Singapore Airlines’ premium economy cabin will be fitted with features and facilities as per travelers’ needs on board. Singapore Airlines is looking to introduce an exclusive “dining concept” in order to take the premium economy to a new high. A premium economy book “The Cook” will be introduced. The premium economy travelers can take picks from “The Cook” selection and the current standard menu as well. They can order their preferred meals prior to boarding. 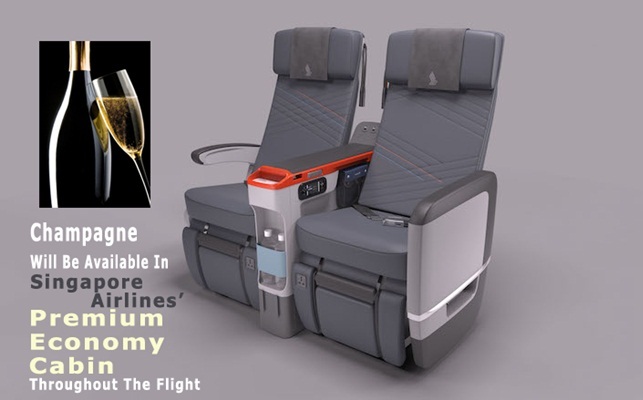 The premium economy passengers will be offered champagne just like icing on the cake. Champagne will be available throughout the flight in contrast to periodical offering of drinks by other airlines. With this unique inflight service, Singapore Airlines will stand out from its competitors. The premium economy travelers will be allowed to check in with baggage up to 35kg, which is 5kg more than the baggage limit in the Economy Class.